Pansy Metal/Clovered Hoof is a set of 12 oversized silk banners created by Californian artist Mike Kelley and used in a 1989 collaboration with choreographer Anita Pace. Kelley and Pace collaborated on a number of projects, including Blonde Condition (1990), Beat of the Traps (1992), Pole Dance (1997), and Test Room (1999). For Pansy Metal/Clovered Hoof, the scarves were worn by performers who put on a kind of punk fashion show, accompanied by heavy metal music of Motörhead. The performance was most recently restaged at the openings of the Mike Kelley retrospective at MOCA, MoMA PS1, and The Stedelijk Museum. Mike Kelley (1954-2012) is considered one of the most influential artists from California. He created a body of pioneering work that mined American popular culture, modernism and alternative, counter culture movements. His works are sharply critical and often quite self-deprecating, dealing with social, political but also very psychological issues in a post punk attitude. Pansy Metal/Clovered Hoof appears almost like crude doodles that one would find in the margins of a high school notebook, desk or bathroom wall. However, here they are enlarged to the size of banners like one would see hanging in a gymnasium, as if the outsiders in school decided to showcase the iconography that symbolized their counterculture in a reduced palette of colours (black, white, red and green). 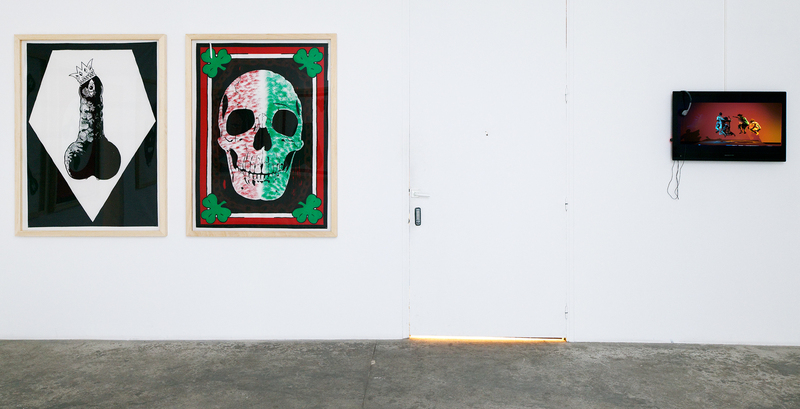 It is a mockery and collision of Irish clovers, male genitalia, skulls and morbid portraiture. The Swatstika in one banner is clearly ridiculed and stripped of its power by placing clovers and/or male genitalia on the ends of the lines. Pansy Metal/Clovered Hoof was originally conceived of as costumes for a performance which was a collaboration between Mike Kelley and the dancer Anita Pace and performed on a fashion show-style ramp to music by Motörhead. In turn the project also satirized the heavy metal genre, which adopted imagery of skulls, devils, and other mordant iconography. Kelley specifically lampoons Motörhead by repeating their superfluous use of an umlaut over the E his own name on one banner with a devils mask. Interested in performance, Mike Kelley collaborated several time with Anita Pace on various “choreographies” including Blonde Condition (1990), Beat of the Traps (1992), Pole Dance (1997), and Test Room (1999). Born in Detroit, Kelley lived and worked in Los Angeles from the mid-1970s until his tragic death at the age of 57. Throughout his thirty-five-year career, he worked in a variety of mediums; drawing, print, sculpture, performance, music, video, photography, and painting. Speaking of his early work and entrance into the art world was through the counter-culture, where it was common practice to lift material from mass cover what is hidden, Mike Kelley exhibited extensively throughout the United States and Europe. Mike Kelley was a prolific writer and critic himself, and his work has been featured in multiple publications. Pansy Metal/Clovered Hoof was restaged at the Stedelijk Museum in 2012 and MOMA PS.1 in 2013. One of the complete set of this edition is in the Rennie Collection.